This site is dedicated to all of us 55+er retirees who seek an affordable and healthy way to escape the northern winters and enjoy life to its fullest. It is intended to serve those interested in this lifestyle and those already taking part. The focus of the site is on the Park Model and other units in the many RV Resort Parks located in the southern U.S. States. We have begun with a concentration on the state of Arizona. This includes the Phoenix East Valley area (Mesa, Apache Junction, etc) North Phoenix (near Scottsdale) ... Yuma ... Tucson ... and points in between. Advertise your Rental. We are now getting people looking for rentals for '19/'20! If you advertise early there is a much better chance you will get a long term renter. Just checking out this experience for the first time - 'have never been'. Already have visited and maybe spent some time in a park and now want to find a park model to rent or buy. Park model owners who want to find information on upkeep, repair, and renovation. Those who want to advertise a park model for rent or sale. RV Parks wanting to attract those new retirees and promote to new buyers ... contact us for details. If you are new at this experience make sure to take the time to read ... About the RV Resort Parks ... About the Park Models ... About the Weather. Check out some of the parks websites on the Park Chart Those listed in 'red' are our 'featured parks' ... they support this website as advertisers which allows us to keep providing this service to snowbirds. When checking out parks pay special attention to their facilities and activities. It will help you get a sense of what the park is like and whether it meets your needs and interests. If you are looking for a park model to rent or buy make sure you are familiar with all the park model and RV park options. Check out some of the rental ad listings in the Park Models for Sale or Rent section. You can also click on the featured park ads on this page and it will take you to their site where you can find rentals/sales and other information. Time to Buy ... ? YES! In our past nine years operating this site we have never felt we could make that statement with confidence. But in the past couple years the value of the U.S. dollar increased along with the U.S. housing/economy recovery. As a result foreign buyers needed more of thier currency to shop in the U.S. Many Canadians (who represent maybe 30% of the market) slowed purchasing and either opted to rent or changed thier winter plans. That reduced market segment has had an impact on the number of units for sale. As a result it is a bit of a buyer's market. But that will change. Markets adjust and part of that adjustment is the foreign buyers' mindset 'sort of' gets used to the dollar issue. And we have already witnessed a change. But all of that aside ... at our stage in life we no longer should be trying to gauge the longer term marketplace ... it's time to just do what you want. Like the park and the unit then buy it. Simple. So ... if you are thinking about buying ... earlier the better. In YUMA at FORTUNA de ORO and SUNDANCE RV RESORT. In TUCSON at RINCON (two parks to choose from). Also in MESA ... GOOD LIFE, VAL VISTA and AGAVE VILLAGE ... parks with lots of options.Some larger (i.e. 2bed/2bath) units can be found at SILVER SPUR in Mesa. In BENSON (SE Arizona) where you can buy a titled lot. In NORTH PHOENIX (near Scottsdale/Peoria) DESERT SHADOWS has affordable park models. But ... If you plan to keep renting then make sure to arrange for next year as soon as possible. We are providing information to help retirees get a sense of what this experience is all about. To answer many of those questions of 'how do we?' ... 'where do we?' ... 'what do we?' ... and the like. We are sure that those same questions are asked all over the northern U.S. States and Canada. Most new snowbirds have spent their lives working hard to afford that nicer bigger home. Lots of room for the kids and such. BUT NOW THINGS ARE DIFFERENT. If you are newly retired it is time to make the big shift to LIFESTYLE FIRST! It is not just about the building anymore. That starts to become less important ... way down the list in fact. Of course you need the basics ... but you will find that those are far less than you ever thought. You have also been used to looking at your home as a potential investment. That 'someday' it may be worth a whole lot more. But that is also different now. 'Someday' has pretty well arrived. It is now time to ENJOY YOURSELF! It is time to ENJOY LIFE and get out and do things. And that is where the retirement parks come in. Most parks offer so many things to do you could never do even a fraction of them. And you will quickly acquire new friends. The atmosphere is as close to the mythical 'small town America' as you will find. If nothing else ... take a look and talk to some residents before you decide. Of course, for some, that big house is still far more important. But give the parks a look. Unfortunately, the latest study done by the Arizona State University (ASU) on the snowbird market determined that (in 2003) there were 300,000 snowbirds who become semi-permanent residents in Arizona over the winter months. This figure does not include the more casual short-term winter vacationers or retirees who stay in hotels or travel through in RVs or other means. Snowbirds spending the winter in the south live in a wide variety of accommodations. 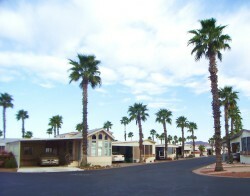 Some use traveling RVs, some rent or buy condominiums, and some rent or buy a park model in an RV Resort park. This latter group represents the largest proportion of snowbird residents. In 2003 there were 160,000 snowbirds living in about 80,000 park model units. A large percentage are in the Phoenix area. The highest concentration being the Phoenix East Valley area which includes the cities of Mesa and Apache Junction. This area has about 33,000 unit spaces, mostly located in the many RV resort parks. One (unexpected) challenge in developing this site was what to call it and how to describe our focus on park model living in Arizona resort parks. It is difficult to know what to call either the parks or the units. (Or even the residents) Some refer to the parks as Retirement Trailer Parks, or Seniors Parks, or Snowbird Mobile Home Parks or 55+ Trailer Parks. The formal name used by most of the parks is RV Resort Parks. But that does cause some confusion. The parks being featured here are those parks that cater mostly to park model style units that are almost permanent. While most of these parks also offer short-term stays for RVs (i.e. motorhomes or other units) they are really quite different than those 'RV' parks dedicated to visitors mostly 'traveling through'. They should probably be called Park Model Resort Parks for Snowbirds or something similar. Many of the parks actually started out by catering to the 'shorter stay' traveler. But what happened is that people began to stay longer and longer. It then became more reasonable to leave the trailer or RV at the park over the summer. But then there was little need to move the trailer or RV so a park model style unit was designed and developed (actually more 'evolved') to be almost permanent. But the parks continued to be known as 'RV' parks.